Rice and detox in the same headline? Yes. There is a belief that we cannot have rice and get healthy or detox at the same time, however being gluten-free and the high fiber in rice is essential to understanding the difference between rice and eating bread. And then there is the conversation about starch. How starch affects our feeling satiated, comforted and calm versus the being bloated, sleepy and foggy. All of that and much more is what I will be teaching about both in my online program and in my upcoming detox program. In this dish I use wild rice which does not have the starch that regular brown rice does, and wild rice is really more of a grass. It contains twice as much protein as brown rice. 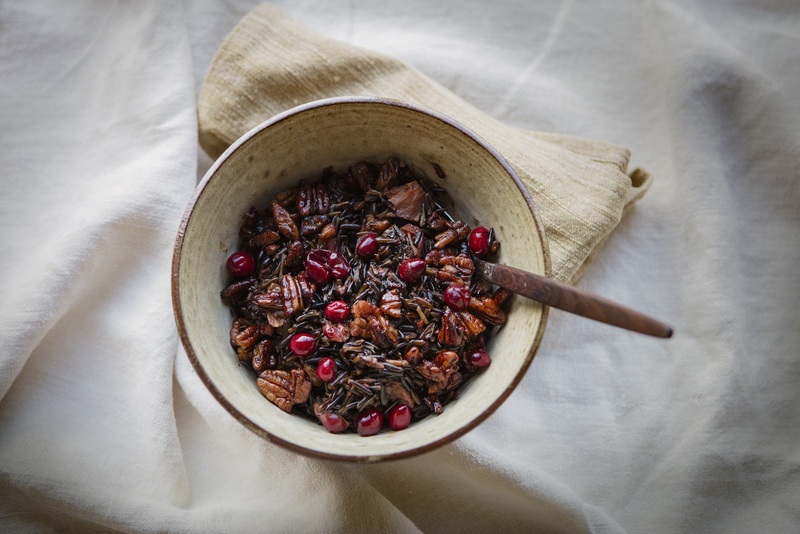 Wild rice keep a low glycemic index, which we want for health, weight and keeping a steady flow of energy. It is also very rich in antioxidants, which is part of why you can use it when you want to eat clean and whole. Chili pepper or red peppercorn (crushed). 1/2 cup fresh cranberries, goji berries or pomegranate to be added after 20 min of cooking to keep them more fresh, but they can also be cooked in from the start. Bring to a boil and then simmer until the water is gone. About 35 minutes. Add the berries after 20 minutes of cooking. Leave it slightly moist when turning off the heat and let it sit for 10 more minutes in the put. 1/3 cup pecans toasted stovetop in a pot with cooking oil (I use sesame oil), tablespoon mirin and tamari and heat while stirring for about 2 minutes until caramelized. Put all ingredients together in a serving bowl.